I bought this top earlier in the week and not only is it my favourite top at the moment, it is also my favourite top I have ever owned in my whole life. 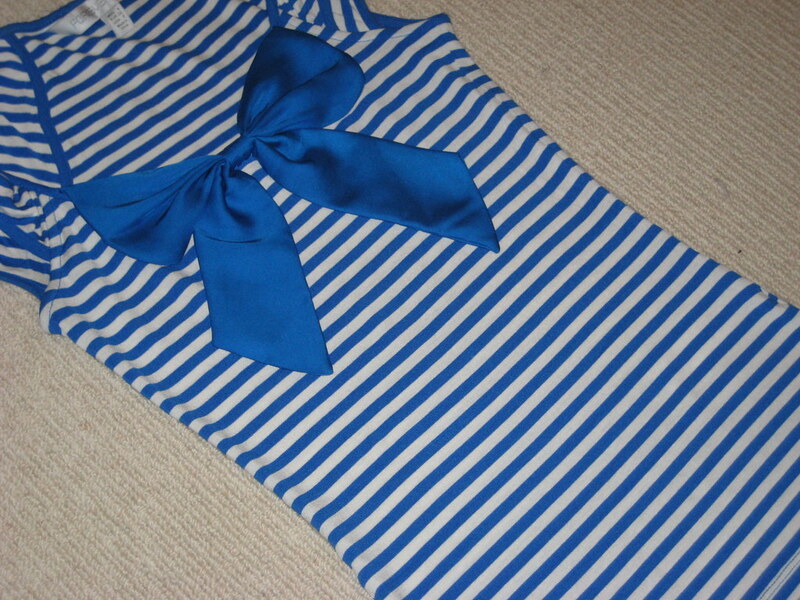 I am always attracted to bows and stripes so it combines two of the best aspects. It wasn’t until I actually bought the top and wore it for the first time yesterday that I realised just how big the bow is; it’s a real feature and makes such a statement. I also love the vibrant bright blue; it’s much nicer than the more subtle shades of blue that I usually see on clothes.It was a very reasonable price at only $29.95; I’m even thinking of buying it in white. 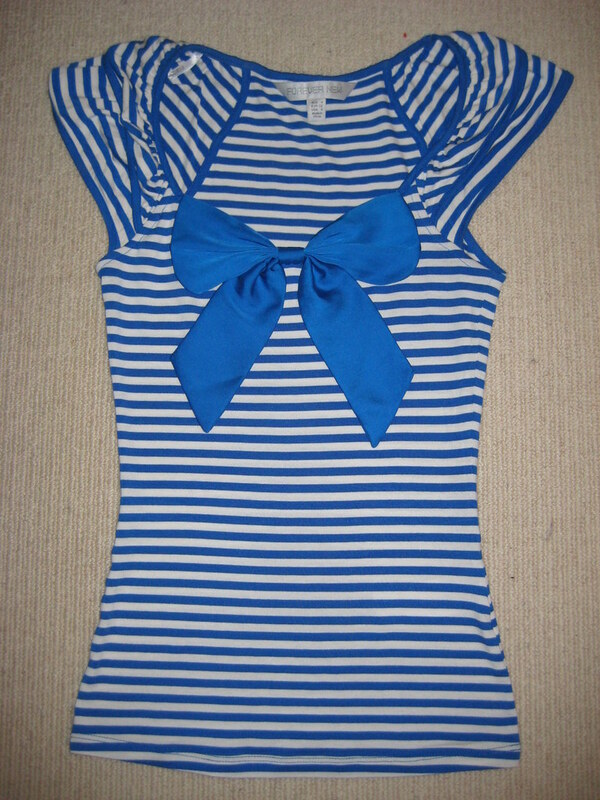 I can’t get enough of my new top; I want to wear it everyday at the moment. This top is much more unique, beautiful and girly than I would have expected to find in a regular store in my local shopping centre. It’ reminds me of something I’d buy from Modcloth or an equivilant online store overseas. This entry was posted in Current Loves. Bookmark the permalink. I love it too! It's so sailor!!!! Brilliant! And yes, when I saw it, I thought Modcloth! The top looks great. Stripes are my favourite, especially if they're white and blue. Im going to Forever New on the weekend I hope they have one in red. I love just about everything in Forever New hey. This is adorable! Gorgeous top! I can see why you love it so much! The bow is just perfect! Cute top! I'm a fan of bows and stripes. 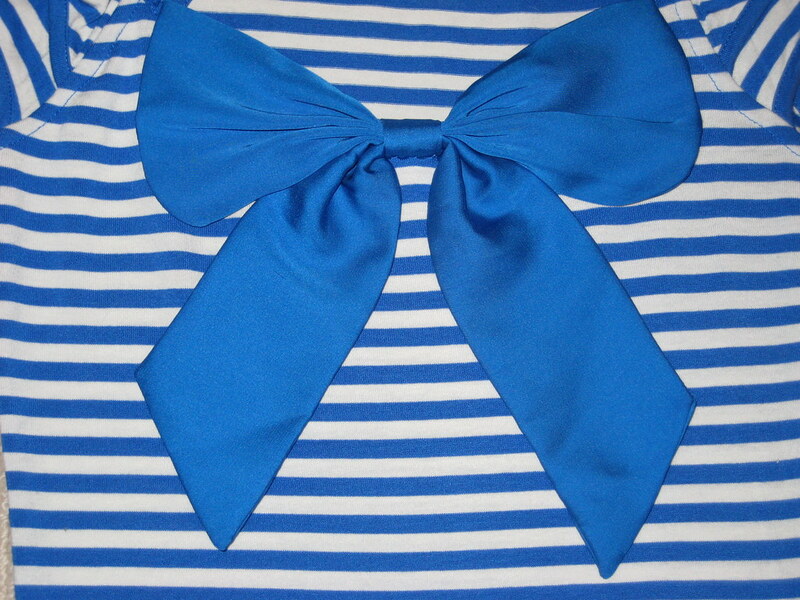 I have something similar but in black and white and the bow is on the side. The bow on mine is hilariously huge but I love it. Great buy!